This corned beef hash, made of potatoes, onion, butter, and corned beef, turns St. Patrick’s Day leftovers into homemade lusciousness any time of day. One Sunday morning, as I sat cross-legged at the kitchen table, all moony-eyed as he prepared breakfast, The One rifled through the cupboard and pulled out a can. He cranked open the lid, wrapped both hands around the inverted can, and pumped it up and down over the skillet as if he were pile driving a wooden post into the ground. On the third try, it happened—the long, slow can fart as the contents loosened and plopped into the pan. There it sat, a giant plug of gelatinous substance, the tin can’s bands embossed around its middle. Not even a mutt with a rib cage like a xylophone would be tempted by that. “You eat that?” I grabbed a fork and began mashing it down in the skillet. “Yes,” he said, looking at me as if l’d insulted the dowager queen. He explained that corned beef hash was a staple of his father’s family, who live in Pennsylvania Dutch country, where weekends mean hash. When I was growing up, corned beef hash and other such delights of delis and diners never crossed our threshold. It’s not that Momma Leite was anti-delicatessen in the least. She cooked what she knew, and what she knew was Portuguese. Corned beef hash was so foreign to our table that I’d actually thought it was called “torned beef hash” because of the small chunks of meat. The One slid a plate with a mound of the stuff, along with two eggs, in front of me. It was now his turn to moon. He watched, waiting for me to take a bite. I took a forkful, wondering if Dinty Moore is owned by Alpo, and manned up. I mostly tasted salt with a slight tang. The meat had no integrity, no muscle. But I knew the act of eating it somehow closed a circle that started at that table, looped around Freeburg, Pennsylvania, and returned to The One. Regardless, for years after that I stayed away from corned beef hash, passing over it on diner menus and choosing instead as accompaniments to my eggs a side of bacon, sausage, or steak—meats that cut a fine figure on the plate rather than sitting slouched over in a pile. What’s curious, though, is corned beef itself is another story. When I moved to New York, I was introduced to Reuben, of the Lower East Side Reubens, and had a dalliance so consuming, so enraptured, that had I been dating someone at the time, I would’ve surely felt the prickles of infidelity on the back of my neck. But the life span of these kinds of passions are brief, and I eventually grew weary and moved on to other heroes of Second Avenue delis. Recently, the urge returned, and Reuben came a-knocking. By now I knew I could make my own—-the sandwich, the bread, and the meat. For some reason, I’d long thought that corning was a process that could only be accomplished by a rabbi of considerable girth presiding over large wooden barrels hidden in the bowels of a deli. When I went on my own beef corning-bender, I churned out slab after slab of meaty pink striations. (No, sir, I ain’t ‘fraid of no nitrates.) But despite my legendary Fatty Daddy appetite, there are only so many sandwiches I can consume before monotony once again descends. Recalling that gelatinous tower belly-dancing in the pan, I decided I’d be damned if I couldn’t build a bigger, better, more manly-man version. Into the kitchen I stepped, and there on the cutting board and in the skillet, not only did I succeed in giving corned beef hash the cojones it deserves, I closed another circle—ours, this time. A circle that began in that other kitchen all those Saturdays ago, when Buddig turkey, Burger King, and Betty Crocker dominated, and when a can stuffed with food of questionable origins served as an unlikely aphrodisiac. This recipe turns leftovers into a luscious mess of lusciousness. Lucky, lucky Irish. 1. Bring a pot of salted water to a boil and carefully slide in the potato cubes. To avoid nasty burns from splashed water, use a slotted spoon to lower the spuds into the water. Cook the potatoes just until tender, about 3 minutes, checking them a few times for doneness, as the last thing you want is corned beef mush. Drain and set aside. 2. Meanwhile, heat the butter in a large skillet–we always use our cast-iron beauty–over medium-high heat. Scrape in the onion and a good pinch of salt and sauté, stirring occasionally, until glossy and tinged with brown, about 5 minutes. 3. Dump the potatoes into the skillet and cook, stirring occasionally, until browned around the edges, about 5 minutes. 4. Stir in the corned beef, sprinkle with a wee bit more salt and a generous grinding of pepper, and cook, stirring only occasionally, until crisp and browned. The trick here is to let the hash crisp but not burn, seeing as too much stirring or fussing will cause the potatoes to break. 5. Scoop the hash onto plates, top each portion with an egg, and sprinkle with parsley, if desired. Serve pronto. If you want to fancy up this corn beef hash recipe, rather than just plonk an egg on top, you could make a hash rendition of toad in a hole. After the hash is almost completely cooked, make four holes in the hash and carefully break an egg into each. Lower the heat to medium, cover the skillet, and let the eggs set just so the yoke is runny and oh so luscious. 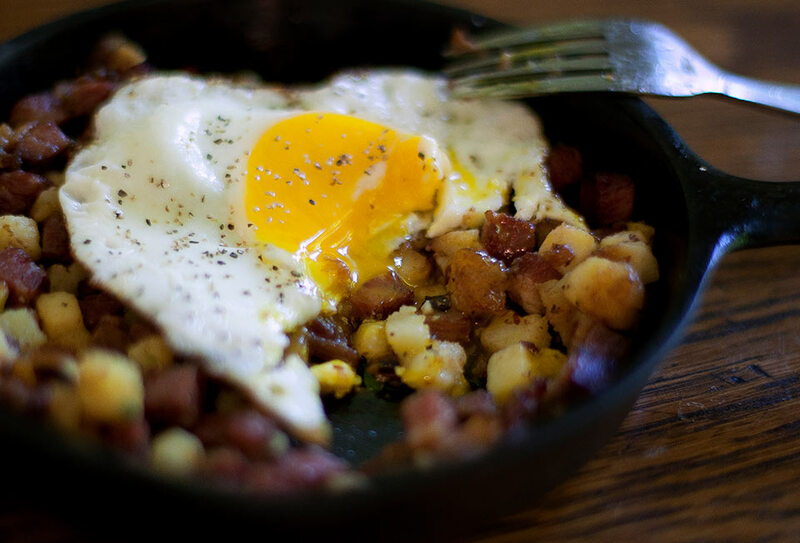 Corned Beef Hash Recipe © David Leite. Photos © 2013 David Leite. All rights reserved. All recipes and photos used with permission of the publisher. For St. Patrick's Day this year, I decided to make corned beef from “scratch" using the recipe on the site. (It's a good one.) One of the best things about corned beef, to me, is being able to make corned beef hash with the leftovers. This corned beef hash recipe is exactly what I did with most of the corned beef that I made. It was brunch one day, breakfast another, and lunch a few days later. I cut my potatoes into 1/2- to 3/4-inch pieces. My corned beef was cut into 1/2-inch pieces. I poached eggs to go on top of the corned beef. The oozy yolks dribbled down through the pile of crisp potatoes and corned beef. So simple and so very good. And a really big plus—no need to get up, get dressed, put your name on a waiting list, and stand in line at the local or latest “in spot." You can make at home what you were going to get there, and you will probably be using much better ingredients. All in the comfort of your own home. This corn beef hash does look very delicious. My mom used to make that for us every once in a while, we all love it. I’ve also had it in various resteraunts, but it’s been a while since I’ve had it, but I’m sure I would still enjoy it as long as it doesn’t have cabbage in it,lol. Chris, I hear you. I’m not a fan of corned beef and cabbage–no matter who makes it. David, thanks for the excellent recipe. I grew up with corned beef hash! Being Irish and middle class, we used everything. One twist I love is red flannel hash. Throw some beets into the mix! YUM! Also, I think corned beef and cabbage is something you have to grow up with to love. Some of my friends from Haiti say the same thing about that drink Malta. I cant stand it, but they love it. Bridget, sounds great. I had red-flannel hash at some resto a while back. But even The One draws the line at CB&C. We’re just not fans–which is odd for me because I love a New England boiled dinner, which isn’t that different. Momma Leite used to make a mean boiled dinner when I was a kid. I make my corned beef hash differently and I put a poached egg on mine. I cook potatoes, diced carrots, and turnips, mashed when cooked. Then I fry up onions, mushrooms, celery, and canned corned beef. Then I mix with potato. It’s more of a comfort food for us. But I have fried up leftover boiled dinner and threw in my onions and corned beef in and served it with a poached egg! karenkeg, sounds interesting. It’s kind of like a chunky veggie mash? David, your recipe sounds good, but I refuse to eat canned corned beef hash for ANYone! Loved your Alpo remark because I have always said it smells like dog food – I just didn’t defame a particular brand! That’s it, girl. Stand your ground. I was young, in love, and had an iron stomach, what can I say?! Coming from a Jewish home, corned beef (not hash) and pastrami were sacred, considered treats in the realm of the godly. But I never liked either one. I would consider tasting homemade. But there is something so rustically appealing about corned beef hash and eggs (throw on a toasted bagel). And how utterly romantic to eat something prepared by the beloved only for his sake. I think we have all been there. Jamie, you REALLY have to come and spend a few days with us in CT. I’ll make you all sorts of homey treats. You’ll walk out of here a converso–so to speak. My husband is a huge Hormel/Spam fan and has introduced it into my children’s culinary vernacular. I have to make it for the kids every so often, and now realize why there’s some cringing whenever I do— it is reminiscent of Alpo! The DH is not averse to the real version— he just made it last week, using up our leftover corned beef. All we were missing was that fried egg. rebecca, well, see if The DH will make the real thing more often. Those poor kids are probably going around school telling friends their mom’s serving them dog food! If Child Protective Services comes a knockin’, ring me. I’ll vouch for you. Anne, ha! Yes, you and The One do have some sort of mind meld. And I love “Hash Can.” And, on behalf of cooks everywhere, I apologize for the torture that was delivered unto you when you were a child. no one should have to go through that. I just remembered something: When I was at Carnegie Mellon University, I had an art-major roommate who made a movie the likes of which grossed our his entire class. He took a can of corned been hash, removed the label, and carefully pasted on a dog food label he removed from an Alpo can. The movie consisted of him opening the can and eating the contents. Oh, those artists…. This post slipped by me somehow. I remember seeing the image, but must have thought it was another installment of Instagram. But once again, I’m charmed by your words. My father would live on canned corned beef hash but my mother would probably divorce him if he tried. But Reubens. Oh, Reubens. Let’s both abstain from them for a spell so we can enjoy them together when next I’m in New York. Deal? Beth, you’ve got a deal. I’ll not cheat with Rueben, if you can abstain, too. Then it’s down to the Lower East Side for us! My own One also suffers from an unfortunate loyalty to canned hash – every time I hear/smell/see the dog food-esque quiver, I question his Oneness! I’ll have to make this version and set him straight. B, sometimes we just have to let our Onenesses have their foibles. It allows for us to have ours! “He simply must drive whenever he’s in a car, no matter whose it is.” Thanks for warning me. That explains so much. Let the record show I did not DRINK a Fatty Daddy on the same night I took David and The One for a lovely tour of the outer Sea Islands of Charleston. Just saying…. However, I have indulged in an expensive jar of those fancy Amarena cherries, which will only set you back 20 bucks on Amazon. Tis true: Kathleen was not even a wee bit intoxicated when she took The One and I on a hair-raising ride through greater Charleston. (I cannot vouch for any other time, though, as I wasn’t my turn to watch her…) And regarding the cherries, to the drinker go the spoils. David: Only you could make corned beef hash romantic–and actually appealing as breakfast! I may have to wait for the right moment to try it again, but it’s clearly worth waiting for. When you and The Nance grace The One and I with your presence in CT, I’ll make it for all of us. I’ll even corn the beef myself. Well, not quite romantic moment I had in mind–no offense–but I promise to enjoy it, as I will the great company. Looking forward to getting together with everybody! Suzanne, I have a long history of disappointing women romantically…. Don’t forget your pajamas, barrettes, and favorite 1978 albums. David, you never disappoint. But I’m not sure what you mean by the barrettes. My hair is 1 inch long, just like it was in high school. Slumber party? Do each other’s hair? Make prank phone calls? How easily the aged forget. your description had me smiling for the last hour… I stopped buying the canned “Stuff” for that reason… and while I love corned beef hash, I never can keep enough corned beef around to make it the next morning. Thank you! manuel, you’re more than welcome. And I certainly hear you about not having enough corned beef left over the next morning. We buzz through it when I make it. I remember that corned beef hash, only our brand was Mary kitchen. ;) Same dogfood-looking stuff, though. Now I, too, make my own hash with leftover baked Red Bliss potatoes, which I smush into chunks, and (sorry, David) canned corned beef. What can i say, I like the way you can tear it with a fork to match the potatoes. I’m totally with you on the eggs — runny yolks are golden treasures. Real corned beef never lasts long enough around me to be made into hash. ruthie, considering your significant culinary prowess, I trust that you canned concoction works. Which brand do you use? Hormel, usually, because that’s what was on the shelves. Lately, though, I’ve been buying the Safeway brand because I understand it’s packed for them by Hormel. Really, the canned corned beef is not pretty although it chunks well, so I’m not sure the brand matters. LOL! It’s never going to replace the “real thing” for a Reuben, but for hash the way I like it — the way my hunting-fishing-camping-Norwegian daddy taught me, do you see a trend? ), it’s perfect. That’s what I thought. just checking, because that’s the brand The One’s mom used. Oh David, your wit tickles me so. The Alpo remark did me in. One of my favorite things about a boiled dinner is using the leftover for hash. Now that my kids are on board with corned beef, I’ll buy more solely for hash breakfasts, much like the recipe here. When I say more, I don’t mean a larger cut of beef, I mean purchasing a few briskets. Yup, it’s a hashapalooza. I adore the stuff! This is my go to recipe. Made it tons of times. Love the story each time as well. My favorite tweek is using smoked brisket and since I was up all night smoking a brisky for NYE, I’m making this delicious hash with the slices that crumbled. bbqgoddess, so happy to hear that! Love the idea of smoked brisket. David, you do know that eating corned beef with cabbage on St. Patrick’s Day is as American as serving turkey on Thanksgiving don’t you? The meat found in Irish pots in the nineteenth century was Irish bacon! But pork was too expensive so when the Irish found themselves in NYC living close to Jewish delis they adopted that form of cured meat. And while many people associate corned beef hash with leftovers from St. Patrick’s Day, this week is when hash lovers should stock their freezers because the corned beefs are on sale! I make hash all year. Ellen, I didn’t know that. Do the Irish?!! I agree with stocking up! It’s so worth it to have hash year round. I love your writing and recipes. The sentence that stood out to me today in this post was “But I knew the act of eating it somehow closed a circle that started at that table, looped around Freeburg, Pennsylvania, and returned to The One.” Such a poignant measure of understanding others through the foods they eat especially as children. I first discovered your website about 13 years ago when my husband returned from a bicycle tour of Portugal and returned home raving about Alentejo Pork and Clams. He found your recipe here and cooked up an amazing batch for us. He said it was better than those he had on his trip! Thanks for your steady supply of candor, humor, instruction and review. Thank you, Anna, for your incredibly touching words. They mean a lot. Warmly, D.
Setting aside some regular corned beef hash for the One, add 1 and 1/2 c. of cooked chopped beets to the rest, give it a glue of Worcestershire sauce, and proceed as usual. You just made Red Flannel hash. It’s lovely. Go for it. Susan, I will!! He adores red flannel hash! David I miss your writing. Loved this. I too grew up in Pennsylvania with corned beef from a can. You got the taste perfectly but whenever I eat corned beef better made, I miss that salty much. Of course I ate it slathered with catsup and gooey with egg yolk. Even with just two of us, I still cook 15 lb of corned beef just for the leftovers. For a twist on your hash, try adding a hefty dose of stone-ground mustard just as you are combining everything. Sláinte. Cammy, that is commitment! Happy St. Patrick’s Day. And I love the idea of a dollop of mustard. Brilliant.